Prepare for whatever 2019 throws your way with our top 5 tactical flashlights from 2018. 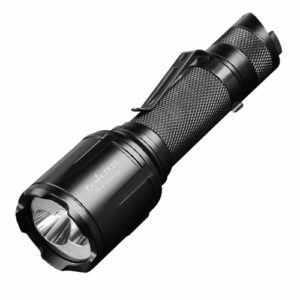 Rugged, ultra bright and designed for everyday and professional use, you won’t go wrong with any of the flashlights on this list. NITECORE spent the past year upgrading many of their popular models with the new CREE XHP35 HD LED and used it to enable ultra bright outputs up to 1800 lumens. 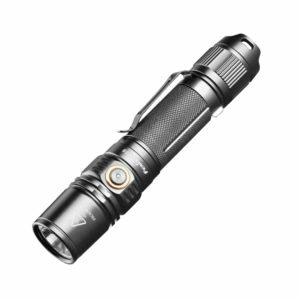 Of all the models to get the “S” treatment, by far, our favorite is the NITECORE MH12GTS rechargeable tactical flashlight. The other big improvement on the MH12GTS? NITECORE moved the micro-USB charging port from the side of the light to the tail cap where it received an internal waterproofing. Not only does that mean you won’t have to worry about securing the port cover, but it moves the USB port which can wear out over time to a part that’s much more replaceable. Equipped with the same CREE XHP35 HD LED as the MH12GTS, Olight’s M2T Warrior tactical flashlight has plenty of features to make it a strong contender for the best tactical flashlight of 2018. 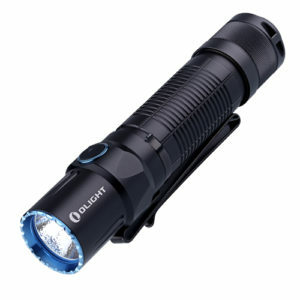 A beautiful, 1200 lumen beam is accessible via a silent tactical tail cap switch while a deep pocket clip and 1” body tube make it easy to operate and carry. Fenix also spent 2018 upgrading some of their core lineup, and the Fenix UC35 V2.0 rechargeable tactical flashlight is one of the best. Fenix swapped in a CREE XP-L HI V3 LED for a full 1000 lumen output with plenty of throw at 291 yards max. The body of the UC35 also received some attention with an upgraded metal side switch and stouter body to make for a great overall feeling in the hand. The UC35 V2.0 also features a micro-USB charging port, allowing you to charge from power sources like solar panels, power banks and of course, traditional outlets when paired with an AC adapter. For something a little different and extremely durable, Olight introduced the Warrior X rechargeable tactical flashlight in honor of the 10th anniversary of their Warrior series. The brightest tactical flashlight on our list at 2000 lumens bright and 612 yards of throw, the Warrior X is perfect for both handheld and weapon-mounted uses. Olight pulled out all the stops for this flashlight including a magnetic tail cap that lets you add a pressure switch without removing the tail cap (and makes charging a snap!) and a silent vibrating low battery alert so you can stay covert in all-dark situations. 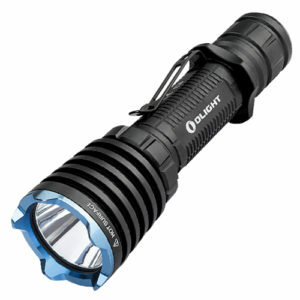 Rounding out our list is the Fenix TK25 Red tactical flashlight. 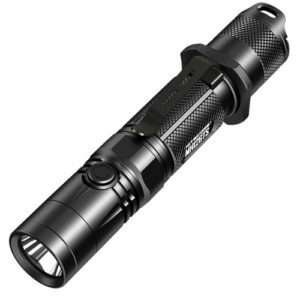 Fenix took an already powerful 1000 lumen flashlight and added one of the strongest pure red outputs around at 310 lumens max to make a tactical flashlight you can use for hunting and law enforcement. A clever twist design on the head allows you to switch between the two outputs while a dual switch tail cap adds On/Off and brightness adjustment control.